Bath tourism businesses struck gold at the region’s top awards for the industry last night with the Roman Baths picking up two major titles and the city’s top hotels also among the winners. A record number of finalists across 28 categories were announced at the Bristol, Bath and Somerset Tourism Awards ceremony, which was staged at Bath’s Apex Hotel and sponsored by Bristol Airport. Nearly 300 guests attended the black-tie dinner and awards ceremony with the 84 finalists ranging from hotels, guest houses and pubs to visitor attractions, walking tours and festivals from a region that spreads from Bath and Bristol and across Somerset to Exmoor. 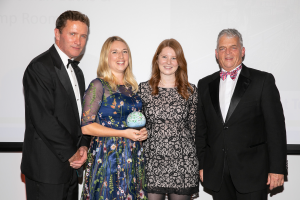 The Roman Baths – no stranger to winning awards – landed Gold in both the International/Inbound Visitor Experience of the Year, and Large Attraction of the Year categories. The attraction, owned by Bath & North East Somerset Council was also highly commended after being shortlisted for the Age Friendly Tourism Business of the Year award. Earlier this year it came top in the Inclusive Tourism category of the national VisitEngland Awards for Excellence. Bath’s Historic Venues – the group that markets the Roman Baths, Pump Room, Assembly Rooms, Guildhall and Victoria Art Gallery – won the Business Tourism and Venue Gold Award, while the University of Bath took the Silver in the Business Tourism and Venue category. Bath’s hotels cleaned up in the accommodation categories with the Kaleidoscope Collection’s boutique No 15 Great Pulteney Street winning the Large Hotel of the Year Gold award and the Gainsborough landing Gold in the Spa, Pampering and Wellbeing Experience of the Year category. The Queensbury topped in the Small Hotel/Boutique Accommodation of the Year category while its Olive Tree restaurant took top honours for Restaurant/Bistro of the Year. It was also a good night for Three Abbey Green guest house, which walked away with two bronzes – for Access and Inclusivity Award and Bed and Breakfast and Guesthouse of the Year – and was highly commended in the Age Friendly Tourism Business of the Year category. As well as hosting the awards, the Apex was also among the winners, securing bronze for Business Tourism and Venue and being Highly Commended Lfor arge Hotel of the Year. Lucknam Park Hotel & Spa at Colerne received the silver award in the Spa, Pampering and Wellbeing Experience of the Year category while it also earned silver for being a Dog Friendly Business of the Year. The Roseate Villa Bath’s canine-kind approach meant it was highly commended in the same category and its front-of-house team landed bronze in the Customer Service Superstar category. Other Bath businesses among the winners were West of England Falconry, at Newton St Loe, which received the inaugural Bob Smart Learning Experience of the Year award, and Battle Archery in Keynsham, which hit Silver for Active and Sporting Experience. The awards ceremony was hosted by BBC Radio Bristol presenter Laura Rawlings and former Bath Rugby captain Phil de Glanville. Bristol Airport business development director Nigel Scott said: “This year’s awards were a fantastic showcase for Bristol, Bath and Somerset.